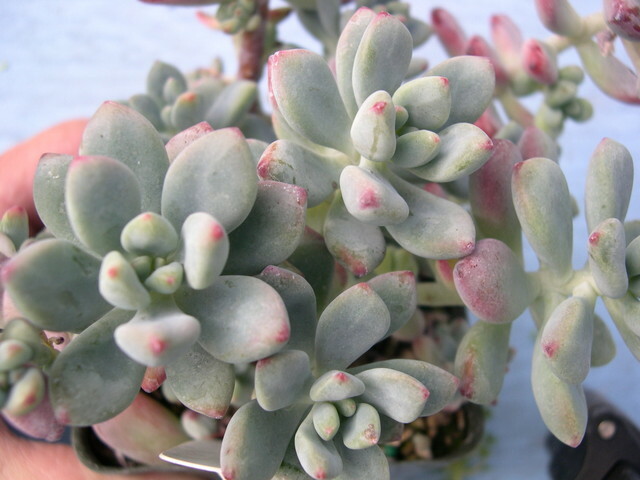 Bright chalky white-blue foliage with purple-red highlights on 12 inch long stems. Stems become bare, except on ends, with time. Occasional flower clusters made up of green-yellow, urn shaped blossoms prominently marked with red-brown. Comes from alpine regions of Mexico that get frost on a regular basis. Will tolerate 10 degrees F. if kept very dry.